ThreatShadow presents CISO with an overall compilation of AI from all the Machine Learning algorithms built into the system, allowing CISO to focus on real threats that matter. ThreatShadow helps CISO draw the line between false positive and critical incidents. 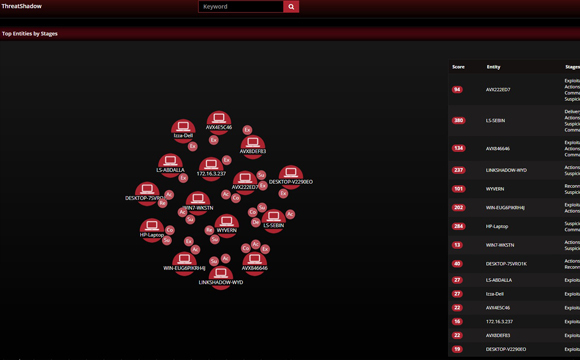 Using intelligent threat scoring and collective profiling of entities and users, ThreatShadow identifies risks taking place in the environment right now and presents CISO with visual representation indicating where did the risk originate from as well as where is it heading to in case the threat is laterally moving across the network and assets. ThreatShadow allows CISO to cross compare the current environment situation with previous dates to verify if certain threats are persisting across time. This feature helps CISO identify the most vulnerable assets and users as well as evaluate the efficiency of other security systems such as firewalls and end-point security.